An East coast transplant combines NYC with STL in a stunning urban loft. 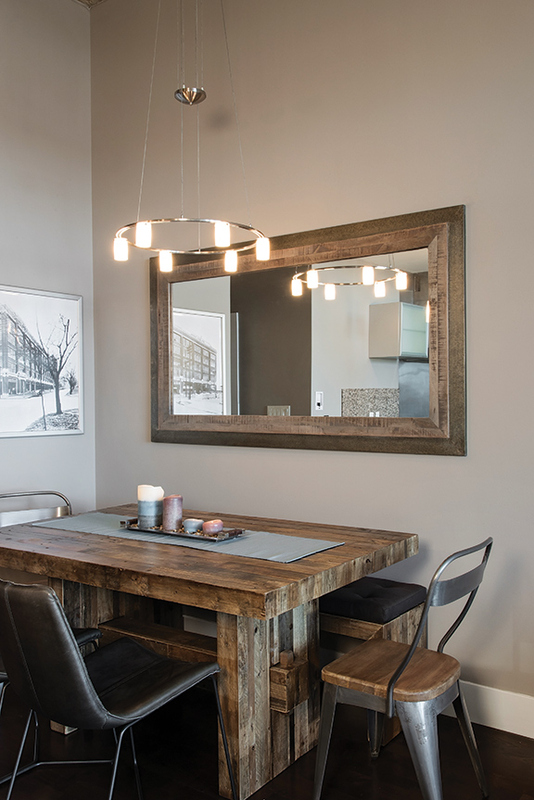 The rustic wood dining table is finished with a mix of metal and leather chairs as well as a bench for ample seating if the homeowner entertains. A large mirror keeps the space feeling open while pulling in the design elements from the table and chairs. An added "bonus" space, the designer and homeowner treated the outdoor patio as an extension of the interior living space by incorporating the same airy color scheme. The focal point of the main living space, the fireplace wall needed to stand out. Candice chose a tile with a wood finish and hints of blue, which carry throughout the space in the furnishings and accessories. Combining her love of New York City and her new hometown, St. Louis, a collage of art and pictures welcomes guests in the living space. A murphy bed was the ideal solution for the spare room, which functions as both a guest bedroom and home office. 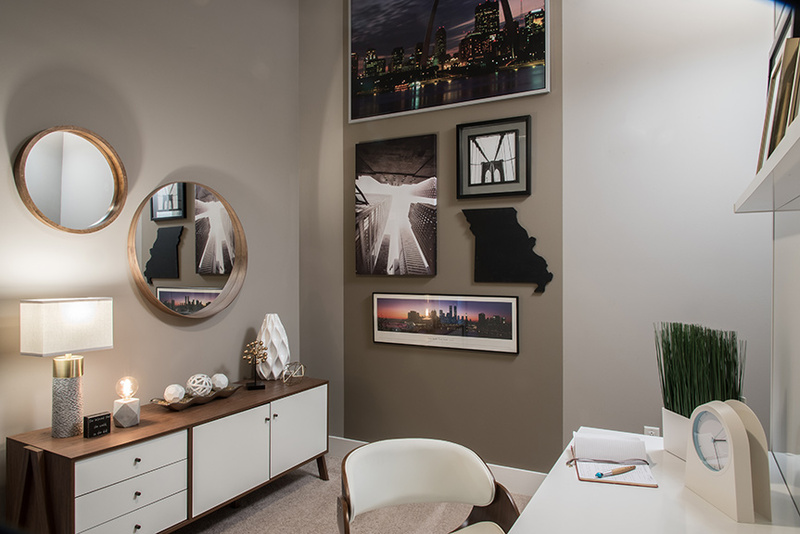 A gallery accent wall is another nod to the homeowner's love for St. Louis and New York City. A cozy sitting area in the master bedroom was a must-have for the homeowner. "They are so classic and romantic," she says. The master bedroom is all about the glam with touches of sparkle, drama and texture. The grasscloth wallpaper accent wall accentuates the tall ceilings and closes in the space to make it feel more intimate. When East coast native Dorian Tomace had the opportunity to transfer to St. Louis for a job opportunity, she thought why not! A change in pace from the hustle and bustle of city living to the more relaxed lifestyle of the Midwest was appealing. After a home-finding visit where she had zeroed in on Chesterfield, Clayton and the Central West End, Dorian fell in love with the urban vibe of the Cortex area on the eastern edge of the CWE. An up-and-coming hub of innovation, the Cortex area has already seen tremendous growth and development, luring many top-name companies to conduct business in the area. In the coming months and years another phase of development is planned to include hotels, retail, apartments as well as a greenway corridor connecting to The Grove and City Foundry, an open-air public market. In addition to being drawn to the revitalization of the area, Dorian immediately fell in love with the West End Loft building. Built in 1914, the building was the first Ford Motor Co. auto plant in the St. Louis area and production continued there until the 1940s. Now a desirable loft building with amenities that include a pool, gym, gated parking, billiards room, hotel room and storage, the unit Dorian purchased in the building was also the right price. “There are not a lot of buildings in the Central West End with the amenities you can get here plus the amount of square footage and bonus outdoor space you get in this unit,” Dorian explains. And because Dorian purchased her unit at such a great price, she was able to make it a “wow” in the design elements. Connecting with interior designer Candice Wideman of Youtopia Designs, the two started with a blank slate to transform the loft into a comfortable urban oasis that combined elements of New York and St. Louis. “I came from a very traditional and conservative home,” Dorian says. “This building has more of an urban feel, and I wanted the interior to also reflect that.” What Dorian didn’t want was for the space to feel too cold, especially with some of the industrial elements like the concrete pillars and ceilings. 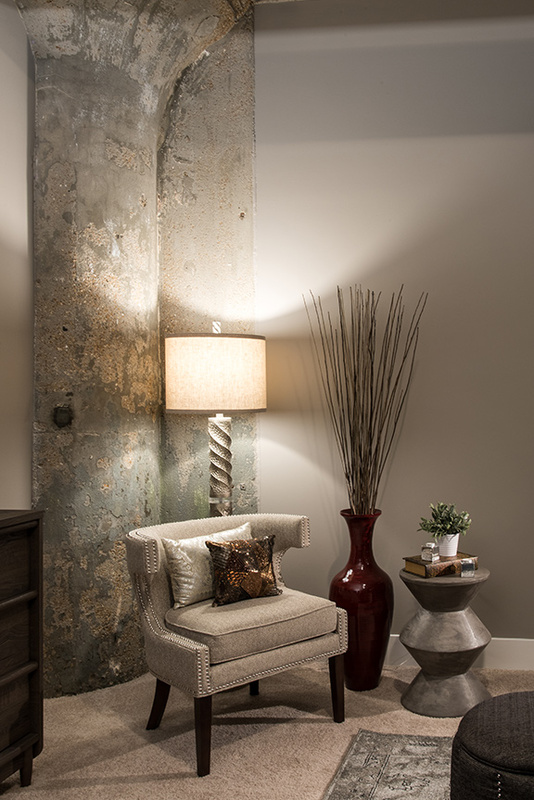 Candice helped Dorian to make her home warm and comfortable by blending the styles into one cohesive look. “Dorian basically brought nothing from her previous residence,” says Candice, who enjoyed getting creative to find the right pieces for each space. For Dorian, the draw of a loft is that it is very open; but she also needed to have some sort of distinction among rooms. Candice brought it all together through the furniture choices and layout. A tile choice set the color scheme for the main living areas. The fireplace, which Dorian loves, was simply a blank, beige wall. Candice envisioned the fireplace as the focal point of the room, so she knew she needed something to guide your eye toward it. She found a great tile with a wood finish and hints of blue. She carried the serene shade throughout the open, airy space. The configuration includes a gray L-shaped sofa and two accent chairs that pick up the blue in the fireplace tile. An abstract coffee table can be pulled out and twisted into different sizes and configurations depending on Dorian’s needs. Dorian also needed a place to sit and eat, so a dining space was created in the living area. “I wanted a table large enough to be able to entertain,” says Dorian. The rustic wood table can be pulled out if needed and includes a mix of metal and leather chairs and a bench. To fill the blank space on the wall Candice found a large mirror, which keeps the space feeling open while also pulling in the design elements of the table and chairs. Many of the wood elements found throughout the open living space are carried into the guest bedroom, which also doubles as Dorian’s office when she works from home. Because she needed the room to serve two purposes, the designer and homeowner settled on a Murphy bed that could be folded down when there were out-of-town guests. The challenge the two faced was finding a bed that had a good-sized, functional desk on the other side. Another challenge in the guest space was a large access panel in the middle of one of the walls. There wasn’t really a good way to get around it. Dorian found a beautiful print of St. Louis that would cover the spot. To complete the wall, Candice painted a darker stripe to make it pop. The gallery wall is now a nod to the East coast and Midwest, and Dorian thinks it really makes her out-of-town guests feel welcome. 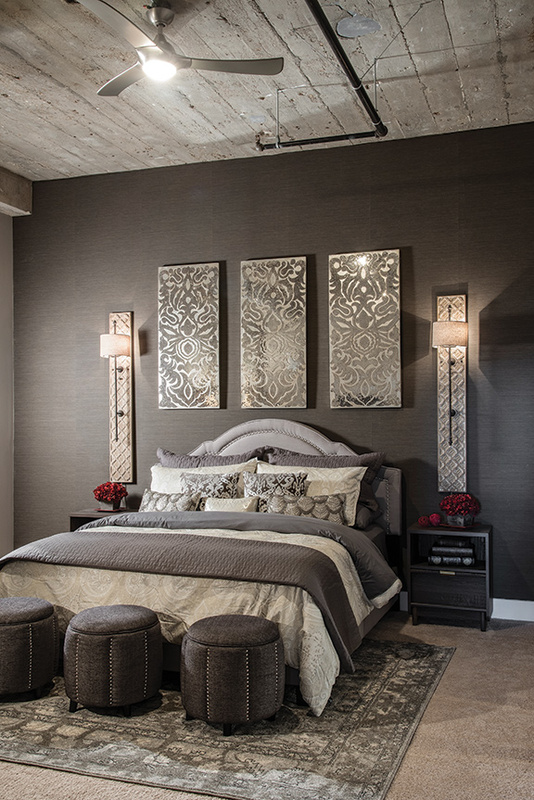 While the rest of the loft has a more rustic, transitional look, the master bedroom is all about the glam. “It was fun to get to work with a single, female homeowner because it allowed me to be able to play up the feminine elements,” Candice says. Calling it Dorian’s private sanctuary, the master bedroom mixes drama, texture and sparkle. The grasscloth wallpaper accent wall was selected to add drama to the room and accentuate the tall ceilings. “The wallpaper’s dark color closes in the space to make it feel more intimate,” explains Candice. And Dorian loves the little bit of texture it adds. Layered on top of the matte-finished wallpaper, the metallic prints add that touch of sparkle and shine. A variety of metals also glimmers in the master, including brass, pewter, gold and silver. Two layered mirrors, an application Candice loves to incorporate, pull together all the metals in the space. “I knew we needed two mirrors to create drama, and I thought the different heights and widths would complement each other," Candice explains. To complete the master retreat, the homeowner requested a sitting area. “They are so classic and romantic,” she says. An added “bonus” space, Candice and Dorian wanted the outdoor patio to feel like another room of the house, so they incorporated the same airy color scheme into the furnishings. Dorian loves leaving the doors open on a nice day. 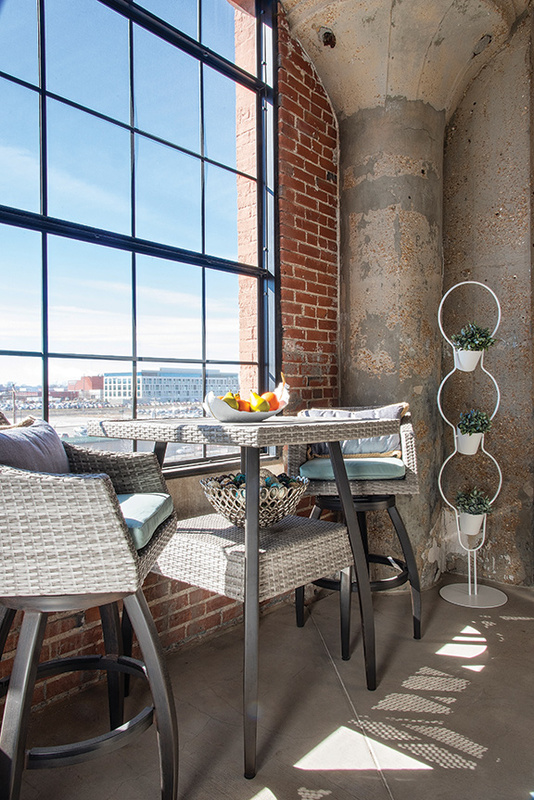 “The patio really added overall living space to the smaller loft,” she says. Dorian has now called St. Louis home for a year and a half, and she loves showing off her beautiful loft (and new city) to family and friends who frequently visit. Blending the urban elements of the loft building with comfortable furnishings, her loft is light and airy…a warm design that will feel fresh for years to come.